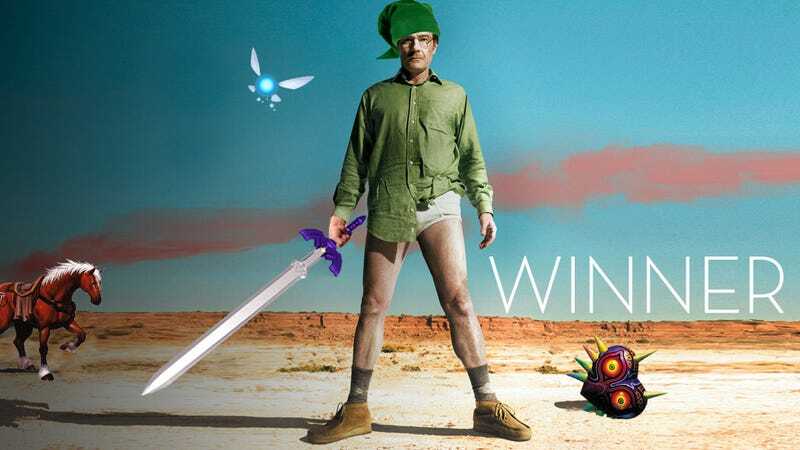 Kotaku 'Shop Contest: A Live-Action Legend Of Zelda: Winners! In last week's 'Shop Contest our image-manipulating community went on a quest to create the perfect live-action Legend of Zelda TV series on the heels of new of a collaboration between Nintendo and Netflix. The winning entries are better than anything those two could put on not-TV. The winning-est entry of them all this week belongs to Cartoonivore, who took a series I'm only mildly interested in and combined it with something I love to make something better than the sum of its parts. Am I referring to Breaking Bad or Zelda? Moving on. Cartoonivore's win doesn't mean the rest of this week's entries weren't just as grand and glorious. Or does it? So confused. Ultramarine-Blue — for Arnold's most important role. TruExtent — though maybe he's a little too evil-ly. Fizziks — because he's pretty much 75 percent of the way there already. Arbek, The Conqueror — because they did say Game of Thrones for the whole family. Tico1313 — for letting Jesus take a turn. Fbs — for creeping me out with papercraft with a real face. Pleasance13 — because this really works. Zaniev — because he'd say yes to the role. CryoGX — though I don't think these actors exist. kaploy9 — sounds about right. uscg_pa — for several hours of Keanu not talking. Damzor — he really is inescapable. Ziebenza — for proving I'm not the only one who watched Once Upon a Time. MrDeadScott — because he's just so happy to be Link. toolsoldier — for helping Frodo find some corn. Drepy — because Link doesn't get much more silent than this. White Fox — for Chris Pratt as Groose. GiantBoyDetective — I'd watch it. billysan — for securing Jason Schreier's vote. Archaois — for the deep philisophical questions raised by... okay for the Spacey pun. Tom Bomb — for the easy-ish route. joshua.klein — for the first Elijah, sans corn. Also_Ran — for at least adding the hat. Cartoonivore — for the win. Come back tomorrow, when I'll be typing something other than what you're reading right now.